My friend calls and suggests that we form a Mah Jong group. The mere mention of that game propels me back to my childhood, where an instant virtual You Tube video plays in my mind. How clearly I see the scene. I see them indulging their love of the snacks my mother puts out: chocolate covered cherries, mixed salted nuts and assorted Danish. I hear them laughing their funny little laughs. 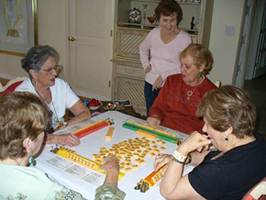 The Mah Jong scene is for my mother’s generation. My friend hires a teacher and eight of us meet for our first lesson. My first surprise is the age of the teacher. She is closer to the ages of my children than to my mother. The second surprise is that I am older right now than my mother was when she was playing. Three months into our weekly games I find I am enjoying the game so much that I decide to buy a set of my own. Onward to the internet. Onward to ebay! I search the sets for sale and get some ideas of market prices and varieties of styles. Tiles made from materials as varied as wood, bone and plastic are available. I see new sets and antique sets. Collector’s items in Chinese hand carved wooden boxes. There are used games for sale, found lying around forgotten attics filled with treasure and trash. Prices range from $40.00 to $900.00. I select the least expensive set and win the bid at $40.00. At our first game my friends and I examine my new set, separate and count the tiles. That’s when I discover that I am missing one nine bam tile, a set of dice and a bettor. I email the seller, hoping he’ll have an extra tile to replace the missing one. Since I’ve already borrowed a pair of dice from my Monopoly game, and have no idea what a bettor is anyway, I would be happy with just a replacement of the one missing tile. He immediately responds by offering me two options: return the set for a full refund or keep it “as is” and accept a discount for an amount I think is fair. Haggling and bargaining are not skills I am comfortable with. I have no idea what price to ask for, how much one tile is worth, what he considers fair, or how much he will agree to refund on a total sale amounting to only $40.00. A Mah Jong set contains 152 tiles; how much is one tile worth? I send him an email suggesting a $6.00 refund. Mah Jong players are such thoughtful and honest people. I’m proud to be one of them.